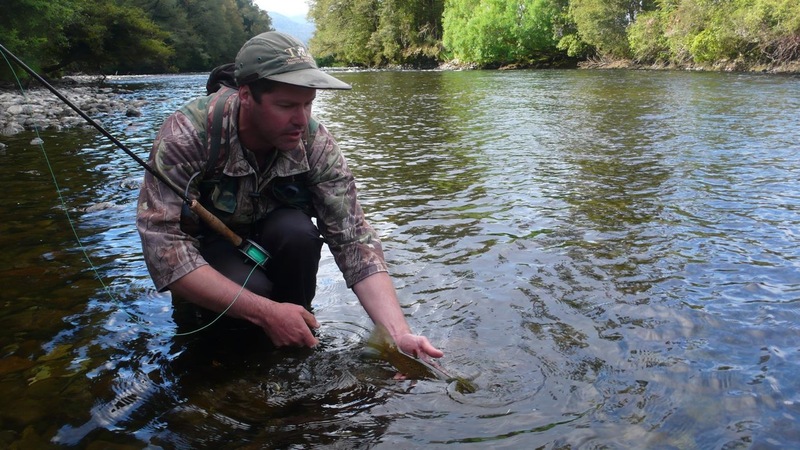 In Episode 5 of the Trout Diaries Radio we chat with Ian Cole, one of the most experienced fly fishing guides in New Zealand, and a character in both The Trout Diaries and The Trout Bohemia books. We talk about the nature of sight fishing, how to do it well and how not to get into trouble with other anglers pursuing similar goals. 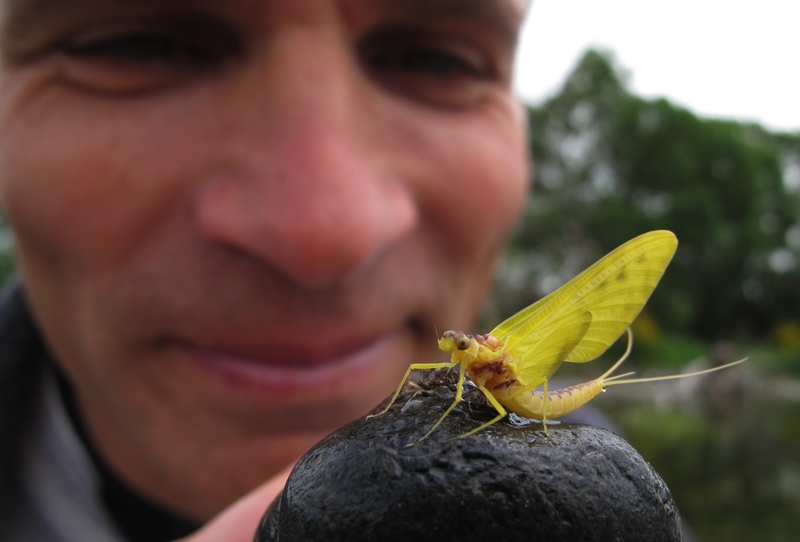 River etiquette for sight fishing is totally different from all other styles and, if we want our space and trout solitudes respected, we need to do the same towards others. So listen and learn what are the exact rules of engagement. We also stray into river conservation issues, it is difficult not to these days. Ian is a vocal activist for water quality and he will also appear in our upcoming documentary The Trout Heaven and Hell. Catch & Release is a concept impossible to explain, even less so to justify, to someone who has not travelled a similar road in his or her fly fishing life and arrived at it too. 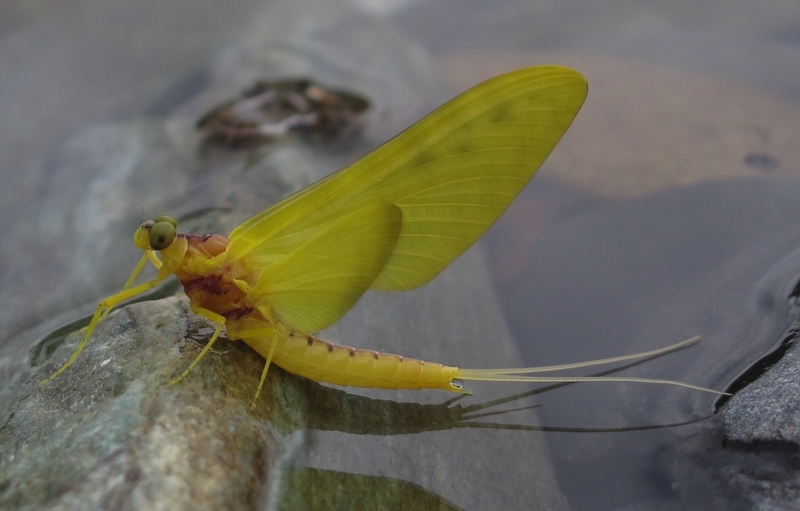 First you just want to catch a fish, then many fish, the more the better, then you move on to sight-fishing and start targeting bigger trout or favour a particular style, say a dry fly, over any other. By then, you’ve become skilled and proficient, accumulated a critical mass of experience. When you see a fish you usually have a fair dinkum chance of catching it, 50/50 perhaps, often more. 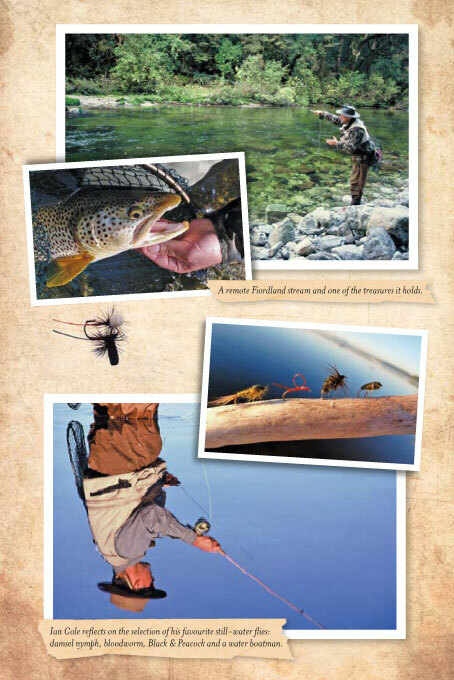 From this waypoint on, you’re enjoying the fly fishing journey even more. Gone are the frustrations, and most of the tangles, and an occasional goof-up is a reason to laugh not to curse. It is about here when, at least according to a traditional progression, you start catching too many fish. 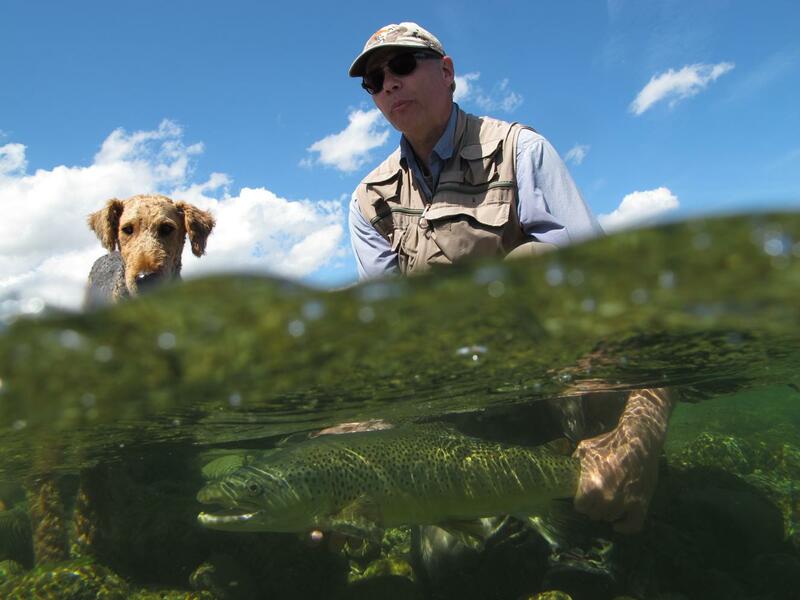 Or perhaps from the outset you’ve subscribed to Lee Wulff’s idea that trout is too precious to be caught just once. So you release the fish you catch, often all of them, and if anyone starts telling you otherwise, your own hackles of temper and indignation bristle to rival Lee’s best Royals. 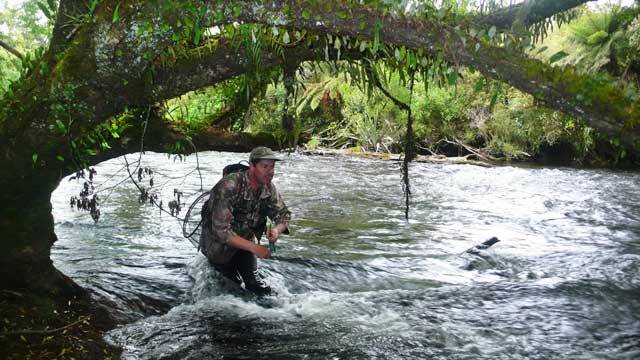 If you’ve travelled thus far down this glorious road of fly fishing for trout, walk with me a few more steps here and you will know for sure how to release the fish so that they have the best possible chances of survival. Picture two men in a boat – two, not three – anchored in a perfect spot on the drop off at one of the Taupo’s river mouths. The lake is glass-out flat and the delightful kauri boat is called Nefer-TT, after the Tauranga-Taupo river, the TT to those in the know. The fishing is good, really good, and every few minutes the tip of one of the rods quivers. The owner of the rod strikes excitedly but then, more often than not, his face drops slack with disappointment. He is still stripping the line but the shooting head is running free again, the tip of the rod straight and lifeless. Every time this happens the older of the two men, only slightly older, picks up his notebook and scribbles something into a window of a neatly drawn table. As I said, the fishing is good, or at least it should be if we did put our best tackle forward. By now, I’ve had seven or eight solid, hang-on-to-your-rod kind of strikes but landed only one fish, while my illustrious companion Michel Dedual, a trout scientist, is doing better, though not much better considering this is his home river and in any case it’s rare to see him lose fish. The problem is, we are testing fishing with circle hooks as a part of a scientific research project to which Michel is contributing data. Circle hooks are, well, circular, unlike the prevalent half-ovals, and they are said to be kinder on the fish. And true enough, so far they have been. Using them, we’ve barely managed to hook a trout. The advantage of circle hooks is supposed to be the fact they are easily removed. Here too, I could not argue. They are so easy to remove the trout can do it without any assistance from the angler, and often even despite all efforts to the contrary. In the name of Science however we persevered though ultimately the idea of introducing and promoting circle hooks into the wider angling community would be abandoned. The setting of such hook is so different from using a standard one, the trout angler’s muscle memory, formed and honed on so many fish and hook-ups, is just too set to be unlearnt and re-programmed. For the sake of your own curiosity, I’ll just mention that a circle hook needs to be set with a much slower and more deliberate round and smooth action rather than the usual upward or sideways snap of the rod. Describing the same principle though during different activity, the old French ski instructors would tell you that, with the keen blade to its skin, you have to “slice dze tomato, not chop it.” If you chop, like I did out of deeply-ingrained habit, Voilà, squash goes the tomato, off swims the fish. So what does it all have to do with Catch & Release? Well, a lot, because our TT experiment was a part of the same quest: how to make the fishing experience, if not less traumatic, then at least more tolerable to the fish we so adore, dream about, idolise and worship. 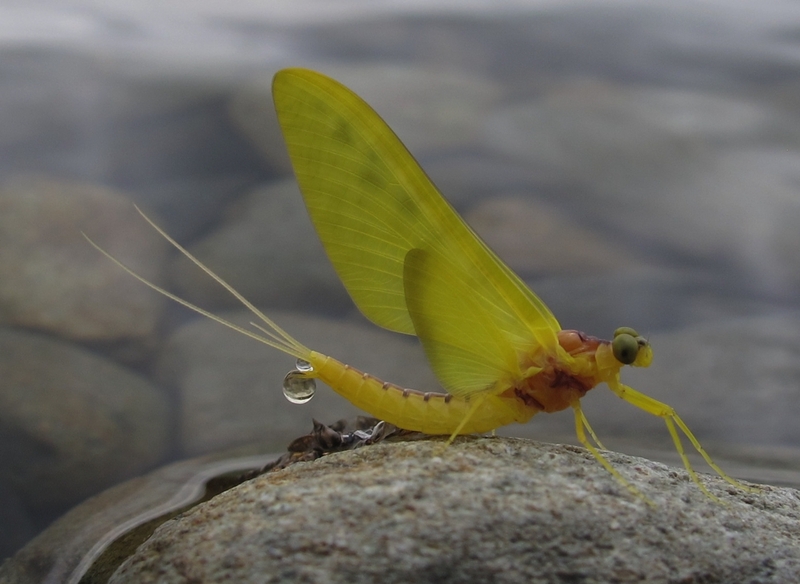 You and me may be considering trout an embodiment of poetry in aquatic motion but looking around on the river you may conclude that we, trout idolisers, are a distinct minority. The Taupo area, for one, is considered a “keep” fishery, meaning that most anglers keep all they legally can, and put back only what’s slabby and undersize. 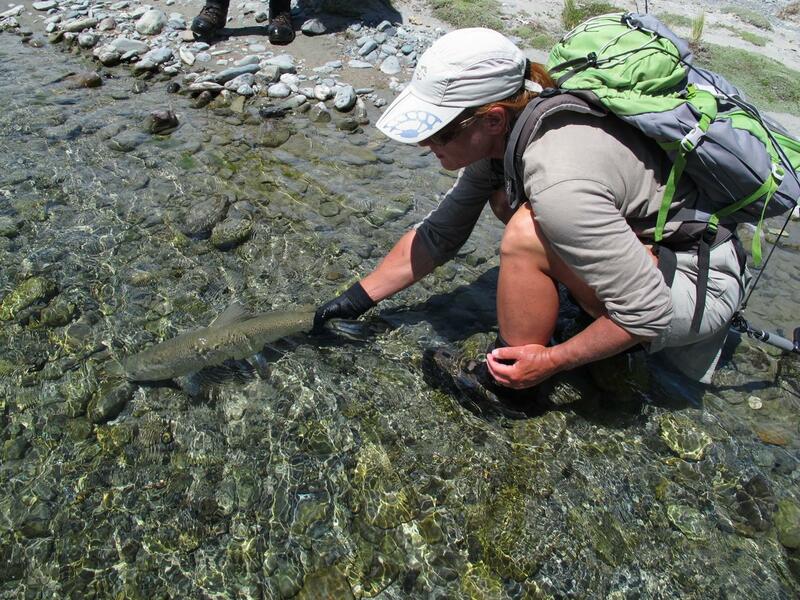 For a greater part of his professional life as a trout scientist in Turangi, Michel Dedual has been crusading for the welfare of the fish and for better education of anglers, whether they fish for table or for sport. From myself I’d add, if you really love the trout and care about their well-being after the release go barbless whenever practicable, especially with large-size hooks, 12s and below. You may end up with a few “long-range” releases but weren’t you going to put the fish back anyway? Often, though not always, after the electrifying moment of the take and hook-up, the playing and landing of the fish is almost routine. Yet this is the part which upsets the fish most, at least until you get it into the net. The next phase is even more important. 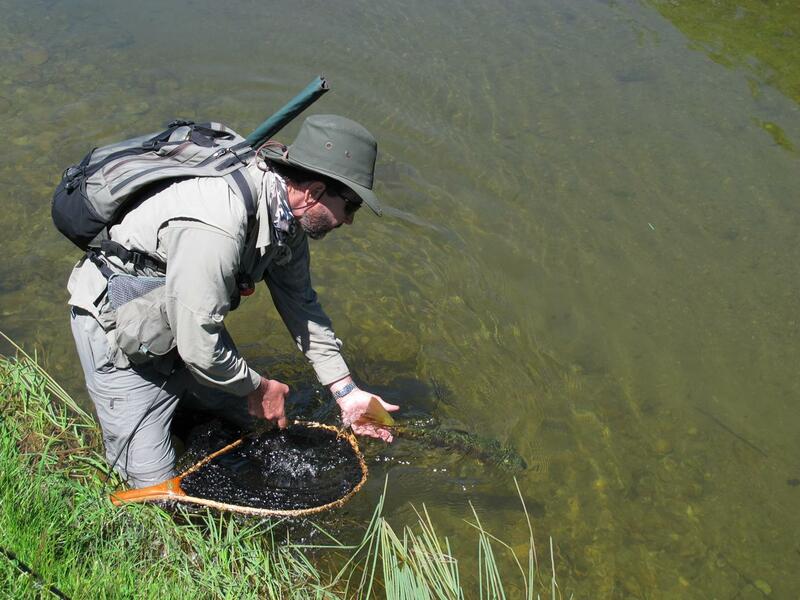 With the right kind of net you can significantly improve the fish’s odds of it surviving its encounter with you. The soft-mesh nets are now becoming de rigour, at least among the conscientious guides and anglers who fish a lot and catch plenty of fish. 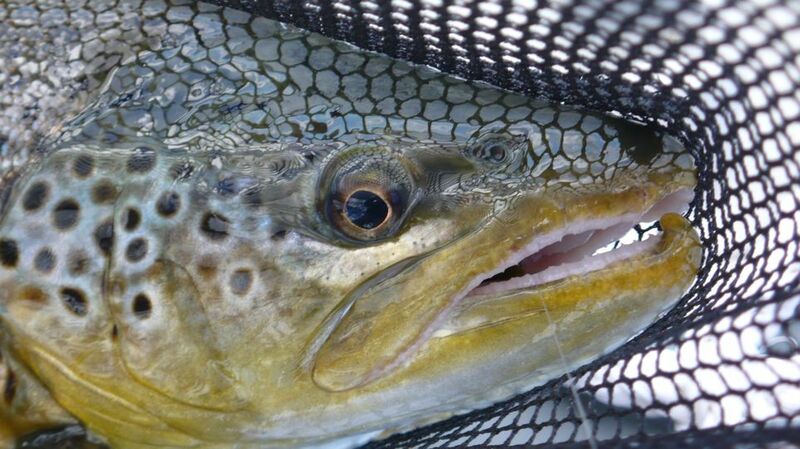 The older nets – the woven-knotted type – are actually harsh enough to abrade the trout’s skin and scrape off some of its protective mucus. If you don’t think so, why do we rinse these nets after every fish, why do they stiffen up when dry? Now that you have a barblessly hooked fish in a soft-mesh net, what next? Why touching the fish can be so harmful to them? “Remember, they are cold-blooded,” he says. “Being touched with warm hands – even on a cold day your hands are likely to be 20 degrees warmer than the trout’s body temperature – is something they’d never in their life experience underwater. With an infra-red camera, you can see the human finger prints on the skin of a released fish for hours, sometimes days after the experience.” They look remarkably like burn marks. So keep the net with the fish in the water, he counsels, remove the hook with pliers or similar such tool, then, if the trout is free of tangles, simply upend the net and let the fish go. If you need to hold the fish – say, to revive it after the fight – grasp it firmly by the tail peduncle (where the body is thinnest at the base of the tail fin) while with your other hand, under its belly, you support the fish’s weight, making sure you don’t squeeze, and at all times keeping its body in the water. Turning the fish upside down will usually stop it from struggling. And whatever you do, keep your fingers away from the gills. They are the most fragile part of the fish, easily damaged. 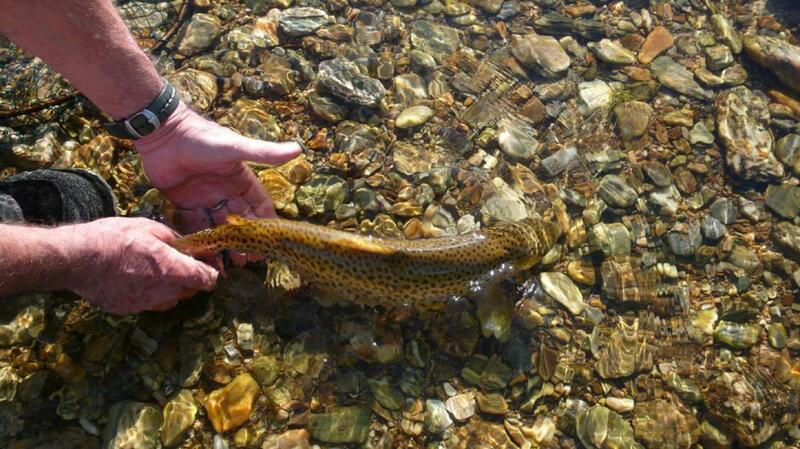 Any bleeding from the gills caused by mishandling is extremely bad news for the trout. If you really want to lift your Catch & Release game to another level, decline the offer of your guide or mate to photograph you with your catch. The trout will be grateful no end for it though, like its fight, the gratitude will be of a silent kind. 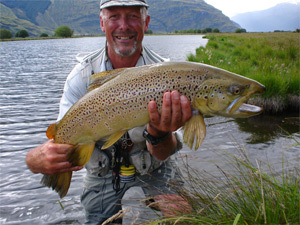 If you think about it, for trout’s sake, do you really need a picture of every fish you catch? “I’ve heard about it,” Michel replied. “Ay, you know what bro? 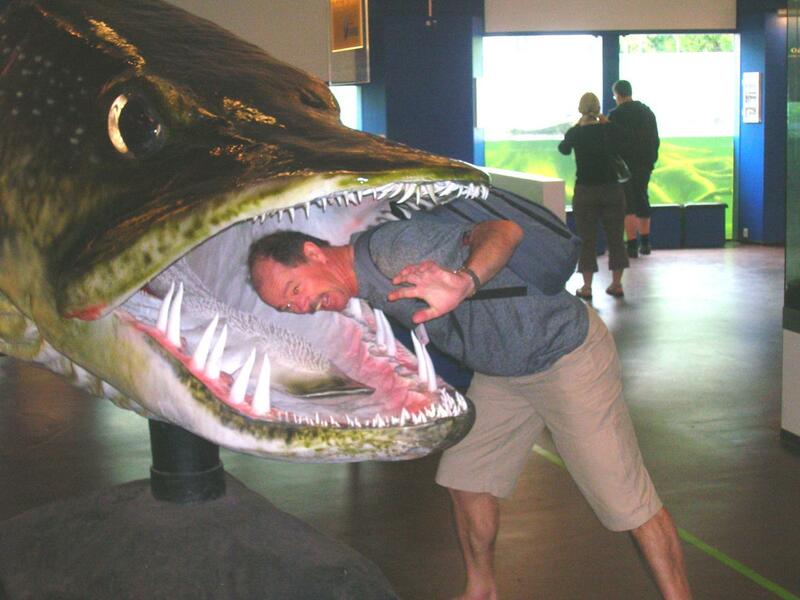 He should’ve put it back, ay!” the Maori angler exploded with jovial laughter.